Thank you for your genuine care to those in need! In December of 2011, we received a donation to our dental clinic from a former patient that we had seen about two years ago. She was unemployed, didn’t have dental insurance, and was in major pain. Her inability to pay for treatment at a private dental office led her to the Aloha Medical Mission Dental Clinic, where she was treated right away without charge. Now employed and covered with dental insurance, she felt the need to give back so that others in a similar situation as hers could be helped. 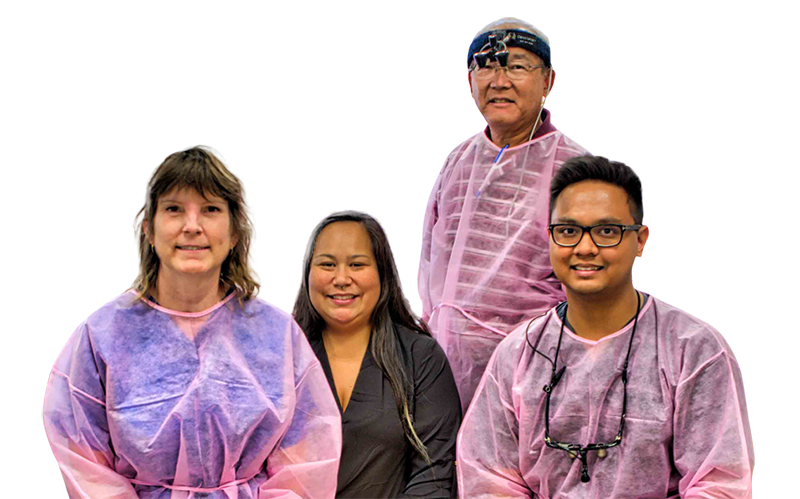 We are an interim clinic and we perform basic dental procedures such as exams, cleanings, fillings, and extractions. Once your oral health is deemed stable, we will refer you to a low cost comprehensive clinic. BEFORE your first appointment please read all of the below and if you are able, download and print the following registration form. Also please bring a valid photo ID, MedQuest/Medicaid Card (if applicable) and proof of low-income status (1 of the 5 listed below). Parking entrance is accessed from Palama Street. We are actively recruiting for dental hygienists and volunteer dentists.